These are low speed granulators for the inline-recycling of sprues made of hard and brittle engineering resins. Depending on the granulator model, a material throughput of 12, 20 or 30kg per hour can be reached. The past twenty years have seen a shift in the attitude and practice of plastics processors to waste – in regard to both their own in-house waste, and also in using plastics recyclate in finished products. Choosing a granulator or particle resizer can be critical to success. Clearly increased environmental considerations have played a part in these developments. “Green” factors continue to come to the fore. Not only that but plastics processors are also making greater efforts with regard to in-house recycling and material savings. Companies are realising that they too must also keep up with current social trends. Many end-user customers today are asking for products made from recyclate. It makes good business sense to supply them with the same. Most processors need a constant quantity of dust-free and high-quality regrind at a constant size. This is the main priority. But there are of course some more important issues: dust sealing, modular design, easy and safe cleaning, efficient and effective power drive design, low noise and compact footprint. Operational safety is also very important. WITTMANN has therefore developed several industry “firsts” to meet these criteria; WITTMANN granulators produce less noise, save more energy, have a more compact footprint, need less maintenance, are equipped with hardened cutting tools, provide for easy cleaning and maintenance, and also have excellent safety features. 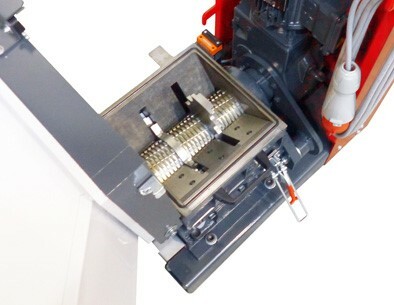 The S-Max series models are specifically designed for the closed-loop recycling of sprues/runners from injection moulding machines with up to 300 tons of clamping force. 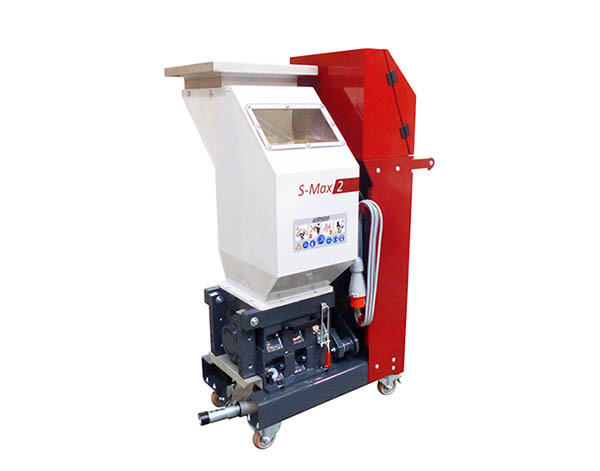 The S-Max is a portable piece of equipment which allows for great versatility and can be moved easily from one moulding machine to another. An interface also enables full communication with the injection moulding machine. As an option, a special shutdown-function is available: When the injection moulding machine is “off”, the granulator stops automatically, helping saving energy. Many more interesting and advantageous features of the new S-Max series come as a standard. A high level sensor gives visual and audible alarm if necessary, and is located underneath the cutting chamber, thus avoiding the overfilling of the bin, and also keeping the cutting chamber free from regrind. This position of the sensor brings about some additional advantages: direct wiring to the electrical cabinet, the sensor’s head not being amidst the material, and full inlet capacity of the bin. The swivel outlet pipe can take different positions, making it easier to connect the flexible hose to the hopper loader. This typically allows for a more efficient use of the floor space next to the machine. The slanted, front cut outlet pipe with adjustable airflow evacuates the regrind more efficiently and also avoids the blocking of the flexible hose. A good access to the cutting chamber is given from above via the 90° tilting hopper to allow an easy perfect cleaning.